It is the most interesting form of Napoleon. After the deal, and before any bid, the dealer goes round and serves out fresh cards from the pack in exchange of as many cards as the players wish to throw away from their original hands. For every fresh card, the players pay one chip to the pool. They must not exchange cards more than once in each round, but they can either refuse to buy any quantity up to five. The cards thrown away are not shown and are not used again till the next deal. 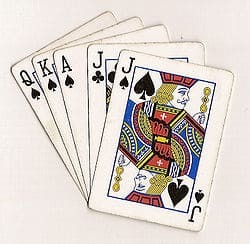 In view of the extra cards brought into the game, Ècarte Nap should be confined to a table of no more than four players, and for the same reason the bids should be made on much stronger hands than the ordinary Nap. Ècarte Nap: At the same stakes it will be found to be more expensive than the latter game, but a great deal more interesting.